With all four countries in Group A of the 2012 AFF Suzuki Cup already having played two matches, Thailand sits comfortably atop the table having taken maximum points against both the Philippines and Myanmar. The Philippines bounced back from its opening day defeat to Thailand at the Rajamangala Stadium in Bangkok to nip Vietnam, 1-nil, courtesy of a late goal by Emelio Caligdong on the second playing date of the competition. The country now sits second in the table with 3 points. Vietnam currently lies third while Myanmar props everyone up after a 0-4 mauling at the hands of the Thais. The group is, thus, well set up for the final playing date for Group A this coming Friday, the 30th of November. Both matches are to be played simultaneously beginning at 9:20 PM (PHL Time) in separate venues. Thailand faces Vietnam at the Rajamangala National Stadium in Bangkok while the Philippines square up against Myanmar at the Muang Thong Stadium also in Bangkok. The top team of the group advances to play a home-and-away semi-final against the second-placed team of Group B. The runners-up, on the other hand, play against the top team of Group B. Drawing lots by the Organising Committee for the AFF Suzuki Cup 2012. Thailand W, Philippines W: Thailand and the Philippines will qualify for the semi-finals with Thailand top of the group and the Philippines runners-up whatever the goal difference. Thailand W, Myanmar W: Thailand and Myanmar will qualify for the semi-finals with Thailand top of the group and Myanmar runners-up whatever the goal difference. Thailand W, Philippines and Myanmar D: Thailand and the Philippines will qualify for the semi-finals with Thailand top of the group and the Philippines runners-up whatever the goal difference. Vietnam W, Philippines W: Thailand and the Philippines qualify for the semi-finals. Only fluke goalfests by Vietnam and the Philippines – which are unlikely – can relegate the Thais to runners-up spot behind the Philippines. Vietnam W, Myanmar W: Thailand will qualify for the semi-finals as top of the group. Goal difference favours Vietnam, who will probably qualify behind Thailand. The only way for Myanmar to qualify is for the team to defeat the Philippines by a large margin and for Vietnam to narrowly win over Thailand. 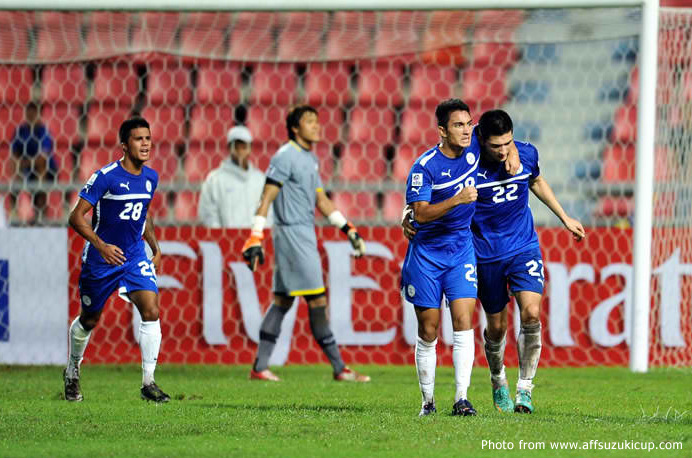 Vietnam W, Philippines and Myanmar Draw: This is the trickiest of the permutations. Thailand will qualify for the semi-finals as top of the group. The Philippines will qualify as runners-up if Vietnam win by less than a two-goal margin, unless the latter win by one goal in a high-scoring match which allows it to overtake the number of goals that the Philippines score. If Vietnam win by just one goal in a low-scoring match that does not give them more goals than the Philippines, the latter will qualify because of the head-to-head rule. Thailand and Vietnam D, Philippines and Myanmar D: Thailand will qualify for the semi-finals as top of the group and the Philippines will qualify as runners-up.